One of the more bizarre stories in Gregory of Tours' Histories concerns King Guntramn of Burgundy who, says Gregory (Hist. 9.21) once had some threads cut from his cloak by a woman whose son was in a critical condition, suffering from a 'quartan fever' (malaria, basically). The woman soaked these threads in water and gave the water to her son, who was miraculously cured. In Les Rois Thaumaturges (round about p.33), the great Marc Bloch saw this story as evidence of the healing powers of the king himself, which was some sort of precursor of the later 'healing touch' of central and later medieval monarchs - although not by any sort of linear development. The story is one of the main supports of the argument that Gregory was a fan of Guntramn and saw him as a good king. For some time I have been at pains to argue that this view - Good King Guntramn versus Bad King Chilperic - is mistaken; over-simplifying at best. Gregory's view of Chilperic was more complex and essentially more positive; his view of Guntramn, after that king became the chief king of Gaul (following Chilperic's murder), being shaped by his fear of Guntramn. 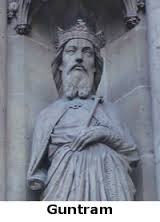 Indeed he had good reason to fear the king of Burgundy since Gregory had been involved in Chilperic's alliance with Austrasia and might even have thought that the pretender Gundovald was a genuine Merovingian; Guntramn was relentless in his pursuit of people in both of those categories. If I am right, Guntramn's healing miracle takes on an especial importance. Ian Wood has pointed out that Gregory depicts Guntramn's miracle in the chapter following that which relates his debate with the Burgundian king and the reading out of the Treaty of Andelot. Wood claimed that the juxtaposition was a covert way of showing that he agreed with Guntramn's point of view, even though he had had to present the opposing arguments of his own king, Childebert II of Austrasia. This points us, I think, in the right direction, even if my own reading will run opposed to Wood's. We do have to look at the tale in the round. The fact that the story immediately follows Gregory's debate with Guntramn and the re-reading of the Treaty of Andelot, in a situation where Austrasia and Burgundy might have been squaring up to each other, is indeed important. So too is what happens in the rest of chapter 21 of Book 9. Gregory recounts that plague had come to afflict the south of Gaul, coming via Marseille and spreading up the Rhône valley into Guntramn's kingdom. 'Like a good priest' (sacerdus [sic]), says Gregory, Guntramn ordered rogations, and fasting and vigils and three days of alms-giving by everyone from the king down, and put all his hope in God. At that point Gregory digresses to tell the story, 'told by the faithful', about the miracle of the king's cloak. He concludes by saying he doesn't doubt this to be true because he has himself often heard the spirits that possess men invoke Guntramn's name to confess the criminal nature of their deeds, in recognition of the king's power. The first point I want to make is that, for all his fasting and alms-giving, the Lord did not hear Guntramn's prayers. Chapter 9.22 tells how the plague went on. This would not fit the idea of a holy man-king in any straightforward way. A true holy man would have stopped the plague with his prayers. When Gregory's uncle, Saint Gallus of Clermont prayed and instituted rogations (Hist.4.5), the plague not only went away, but stayed away from the Auvergne for the rest of his lifetime. Guntramn's gesture was fruitless. Indeed in Histories 9.22 Gregory makes it clear that it was actually the prayers and vigils of the local bishop, Theodore (much persecuted by Guntramn: Hist. 8.5, 8.12), that were responsible for a temporary let-up in the pestilence. The second point one might make is that Gregory is, on the whole, pretty unhappy about kings who try to be bishops, So rex acsi bonus sacerdus may not be the unalloyed compliment one might think (although, from his own edicts, it is clear that Guntramn indeed saw his kingship as a sort of ministry). In that light, the juxtaposition of the ostentatious, public, large-scale - but unsuccessful - vigils, fasts, alms and rogations ordered by King Guntramn with Bishop Theodore's fairly private and humble but effective prayers and vigils is quite significant. Then there is the similarity between the tale of the woman secretly cutting threads from the royal cloak with 1 Samuel 24.4-5 (Vulgate), where David cuts the edge off Saul's cloak while the latter is 'purging his stomach'. There are no verbal parallels but the similarities are clear and surely would have been to Gregory and his audience. What do we make of this? That a woman could secretly cut threads off the royal garments says little about the effectiveness of Guntramn's bodyguard, without whom, according to Gregory, the king never went anywhere (Hist. 7.8 and cp. the reported speech in Hist.9.3). When David was able to do this it was, according to his servi, because this was the day the Lord foretold when 'He would give his enemy to him that he might do with him what was pleasing in his eyes' (1 Samuel 24.4). But David (1 Samuel 24.11) says he did not kill Saul because he was the Lord's anointed. If we take seriously the parallels and the typological nature of Gregory's thinking then this passage is clearly a rather more ambiguous description of Guntramn's priestly kingship than has usually been supposed. If we return to the juxtaposition with Histories 9.20 and the confrontation between Guntramn and Gregory, as Childebert's envoy, then it seems to me that what Gregory is doing here, rather than covertly saying he agrees with Guntramn, as covertly (very covertly, in fact) underlining his disagreement with the Burgundian king. In 'Nero and Herod...', I argued that Gregory's criticisms of the dangerous king were always made in such a way that any accusation of treachery could be headed off by 'headline' praise. We see here this strategy at its most subtle. I propose that Gregory's readers knew enough to see the juxtapositions and the Old Testament parallels, but that any accusation of lèse majesté could be diverted by the 'superficial' reading that this was fulsome praise of the miraculous power of Guntramn's royal ministry. For further thoughts on 'Bad King Chilperic', see this post.